“God blesses those who are poor and realize their need for him, for the Kingdom of Heaven is theirs.” (Matthew 5:3, NLT) There are times when reading Matthew 5:3 I see it reading, “God blesses those who are poor and realize their need for him, for the Heart of Jesus is theirs.” I understand what Jesus was saying but I also know when I am down and out stricken not with financial poverty but poverty of strength and the motivation to keep plugging away. One of the struggles I deal with on a daily basis with the idea that every physical blessing is accompanied by a spiritual blessing, but not all spiritual blessings are accompanied by a physical blessing. Another way I look at that daily struggle is by asking myself which is part of me am I inclined more to be physical or spiritual? It’s really not a choice of either or because we by Divine Design are both, it’s a matter of which one wins out the physical or the spiritual. Picture it like this. In the past Volunteer Fire Departments from neighboring communities would get together for Firefighter’s Field Day and one of the games they would play would be a string a large ball between two posts. Then each department would try to push the ball into the other departments area using fire hoses hooked to a pumper truck. The winner was the department that pushed the ball to the opposite post. That’s similar to struggle going on between the physical and spiritual inside us with one exception we control the water coming out of both pumpers. And just like in the old Indian Chief’s wolf story the one that will when is the one we give the most power to, the one we give the most water to. 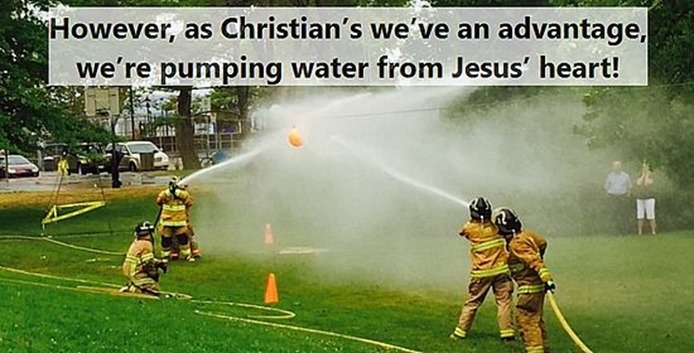 However, as Christian’s we’ve an advantage, we’re pumping water from Jesus’ heart!